This fine sword is a reproduction of a cutlass used by pirates. Our Pirate Cutlass with Scabbard features a 440 stainless steel blade with a short ricasso and a false upper edge. Included with this sword is a wood scabbard with high gloss finish and a decorated chape. The blade collar is steel and features a skull with crossed swords making this an all-around authentic replica. A knuckle bow is featured on the handle, and the curved blade is unadorned except for a skull with crossed swords set just above the hilt. The distincitve spiral wrapped hilt provides a good grip and is accented with a scent stopper shaped pommel. 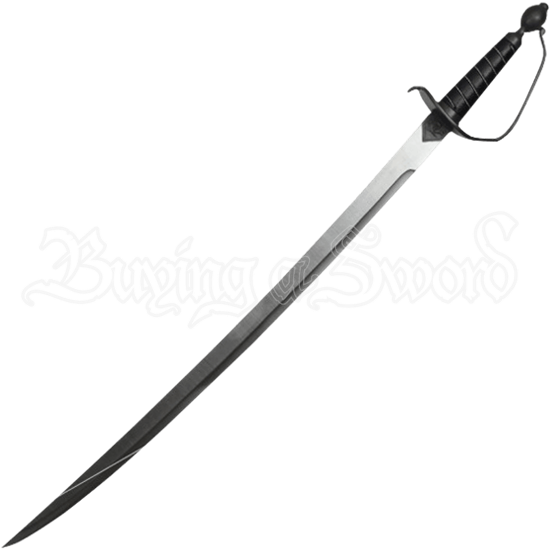 This sword is a replica of the vicious weapons used most effectively in close quarters ship combat that were also quite capable of cleaving through ropes and enemies. This was the choice melee weapon for pirates and sailors on the high sea.